The red-lipped batfish or Galapagos batfish is a fish found around the Galapagos Islands and off Peru at depths of 10 to 249 ft. Red-lipped batfish are closely related to rosy-lipped batfish, which are found near Cocos Island off the Pacific coast of Costa Rica. This fish is traditionally known for its bright red lips, yeah, really red. Batfish are bad swimmers; they use their pectoral fins to "walk" on the ocean floor. When the batfish reaches maturity, its dorsal fin becomes a single spine-like projection. Like other anglerfish, the red-lipped batfish has a structure on its head known as illicium. This structure is employed for attracting prey. The batfish feeds on other small fish and small crustaceans like shrimps and mollusks. The body color of the red-lipped batfish is light brown and a greyish colour on its back, with a white stomach. On the top side of the batfish there is usually a dark brown stripe starting at the head and going all the way down the back to the tail. The snout and horn of the red-lipped batfish is a brownish color. 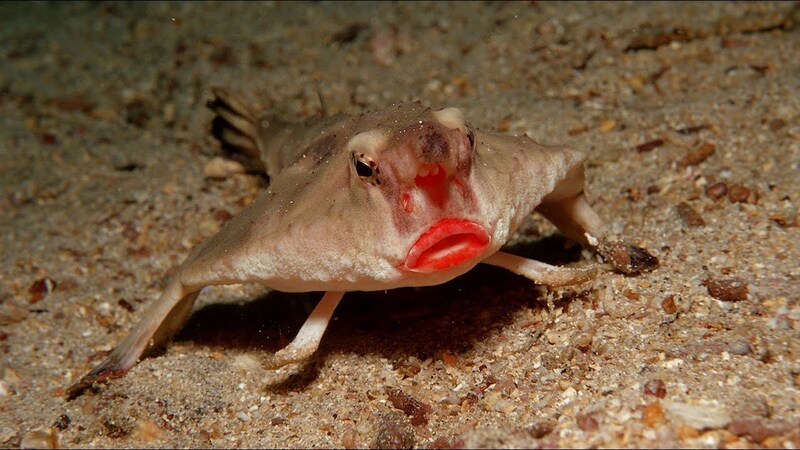 As the name of the fish states, the batfish has bright, almost fluorescent, red lips. The color of the squamation of the red-lipped batfish is shagreen-like with a relatively smooth texture. The bucklers are concealed by a layer of fine spinules. The red-lipped batfish reaches up to 8.0 in in length.